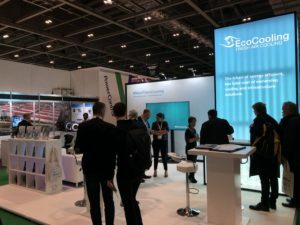 The hundreds of data centre professionals, students and enthusiasts we met over the course of the event have planted ideas and established relationships that we’re positive will continue to grow and strengthen EcoCooling’s position in progressing datacentre infrastructure. And the increasing importance of doing so sustainably. 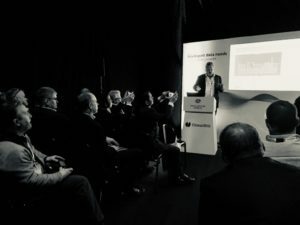 A large number of presentations from over 600 experts across the show floor were delivered with a common underlying theme – Edge computing. It’s coming. Of that, all speakers were in agreement. Some argued that it’s already here. All were uncertain as to its impact. 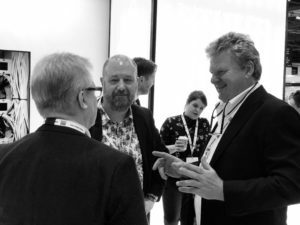 Our MD, Alan Beresford, shared his thoughts in a presentation with Tor Bjorn Minde (RISE SICS); both discussing how a service-based, holistic infrastructure is proving to be an ultra-efficient method for current and next generation data centre build. Funded by the European Commission’s Horizon 2020, the prototype Datacentre, named Boden Type One DC, is returning fantastic early results on efficiency, with the goal of being the most energy efficient site in Europe. Both the consortium and EcoCooling are learning a tremendous amount from the venture. The flexibility of EcoCooling’s CloudCooler®range, developed on the back of such projects, means that whatever challenges Edge computing might bring, EcoCooling are well placed to provide Plug & Play solutions with rapid deployment right off the bat. 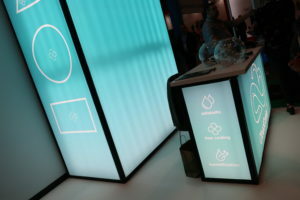 We were able to present our CloudCooler® range of IT cooling units in some fresh and exciting ways this year, incorporating a giant, glowing blue tower into our stand design (in case you missed it) as well as a huge screen displaying the numerous advantages of our innovative evaporative and free cooling solutions. We hope you enjoyed the bottles of EcoCooling water and will find the free tote bags useful on supermarket runs; until next year when we can do it all over again.